As Ebola continues to ravage West Africa, we've seen some signs of hope in the survivors. Two American missionaries who contracted the disease have fully recovered, and now one of them has offered some vital help to an infected colleague. 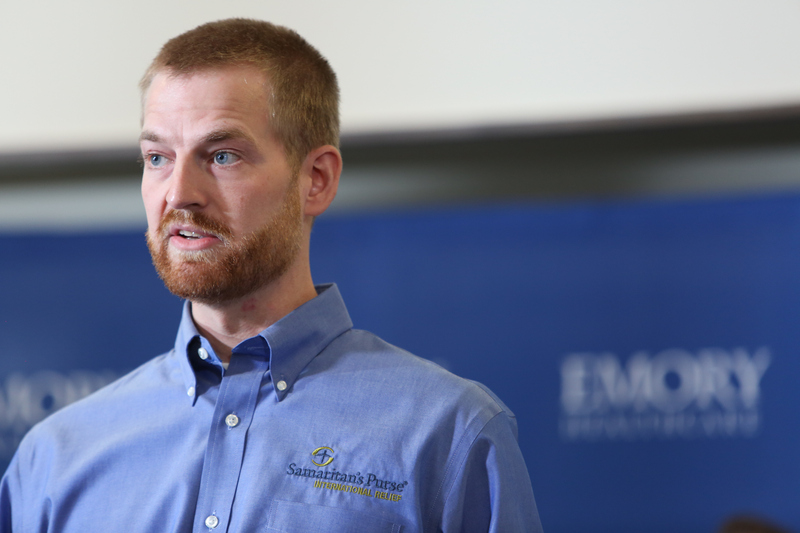 Kent Brantly has donated blood to Rick Sacra, the third infected American, in an experimental treatment that could be the key to curing Ebola. Brantly, who was infected and cured of the disease in August, received a combination of treatments that included a blood transfusion from a 14-year-old Ebola survivor. While doctors are still unsure what exactly healed Brantly, the blood treatment could have been crucial. Now, the health worker is paying it forward and has donated a unit of blood to Sacra, who was infected earlier this month while delivering babies in Liberia. Last week, Brantly flew from North Carolina to Omaha, Nebraska, where Sacra is being treated, to donate his blood to the fellow missionary. Franklin Graham, president and CEO of Brantly's missionary group Samaritan's Purse, told NBC: "His blood was a perfect match." Graham also recounted that when Brantly first saw Sacra last week, the patient's condition was serious. This week, however, Sacra's health has improved significantly. So, what exactly is this blood treatment? Though it's been around for decades and the World Health Organization endorsed its use last week, the treatment is still highly experimental. The treatment stems back all the way to 1890, when a German surgeon used blood serum to treat diphtheria, which won him the Nobel Prize. The treatment was then expanded to fight other diseases, like scarlet fever and the measles. It was first used to treat Ebola in 1995 during an outbreak in Zaire, now known as the Democratic Republic of Congo. In a study published in the Journal of Infectious Diseases, of the eight infected patients who were given the treatment only one died, which reflected a much lower fatality rate than the average untreated patient. However, the findings were inconclusive because the eight patients had received more advanced treatment overall. The concept is simple: Take the blood of a survivor, which contains antibodies that helped fight off the disease, and inject it into an infected person and the same antibodies should be able to combat the new individual's disease. However, delivering the treatment is not as simple. First of all, donors and recipients need to have the same blood type (as with any blood transfusion). Secondly, doctors need to remove the red blood cells from the final serum, screen the blood for other diseases like HIV, and store and deliver it to patients with the proper equipment. Will It Be the Key to Curing Ebola? Experts are divided on the treatment. Some, like Marie-Paule Kieny, an assistant director-general at WHO, think of it as a priority, urging that "all efforts must be invested into helping affected countries ... so that this procedure can be put at play as soon as possible." On the other side, medical experts are calling an "unproven therapy" and pointing out that it's difficult to mass produce. Heinrich Feldmann, the head of the National Institute of Health’s Laboratory of Virology, told Elijah Wolfson of Newsweek that while it would be impossible to collect enough survivors' blood to treat everyone in the same outbreak, we can look at it as a preemptive measure. He added, "If you are collecting plasma now for the next outbreak, then you will have the time to do it."